Fetal ultrasound is first used to confirm the fetus’s position, where the placenta is, and the amount of amniotic fluid. Fetal ultrasound is often used to watch the fetal position during the version attempt. While the uterus is relaxed, your doctor will attempt to turn the fetus. There is also an extensive list of reasons not to perform a version, and many of them are things home birth midwives cannot actually monitor or recognize. Here is a screen shot of utah home birth midwife of 35 years Raeann Peck talking about how she performs ECV, as do her colleagues. This is dangerous and stupid. If someone wants an ECV they need to go to a doctor in a hospital. Safer Midwifery for Michigan is the group that inspired me to start Safer Midwifery Utah. The founder of SMM lost their child during a breech birth by a home birth midwife. They won a settlement but the midwife filed for bankruptcy so she would not have to pay. 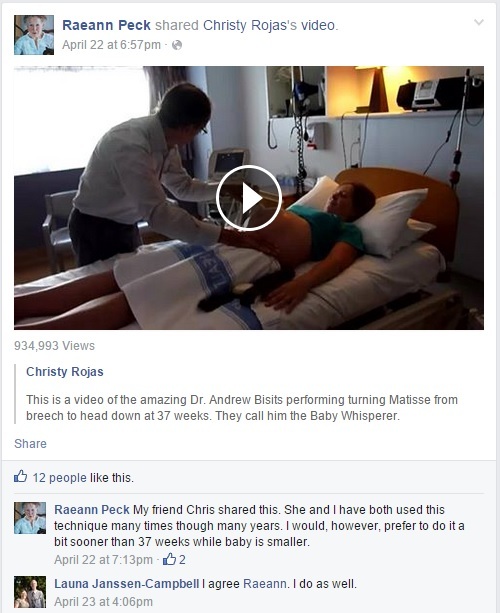 The same midwife is still practicing (Audra Post), and she is still willing to attend a breech birth. Safer Midwifery for Michigan says that she has attended at least 2 deaths, and on Audra’s web page she claims to have attended “over 300” births. Lets round it up to 400, to be charitable, and then she has a notably high death rate of 1 per 200 births. That is shameful, absolutely shameful. Direct entry midwives are like walking cases of dunning-krueger effect, their incompetence is what feeds their sense of confidence in their practices. This is the future for our state if something is not done soon. I have no doubt that our state has one or several Audra Posts in our midst, but its impossible to hold anyone accountable in a system like ours or find out who they are until its too late. The victims of home birth midwives can be made silent in many ways. It takes remarkable strength and dedication to go through a lawsuit when the plantiff knows the judgment will likely go unpaid, and their child will never be brought back by a judgment. To rehash every detail in front of a judge, to your lawyer… the pain of it makes many loss parents turn away from fighting. It is completely understandable. Some might believe the convenient lies that their midwives cook up to cover up what happened. Without very strict record keeping requirements there is no way to determine exactly how many babies died preventable home birth deaths in Utah, though if Oregon’s numbers are any indication its far too many (these numbers were collected when Oregon had the same legal requirements for midwives that Utah currently does). Please click on the action guide on the left side of the page to contact your legislators about preventing the next home birth tragedy. We, the Utah Midwives Organization, are aware of the reported charges against Vickie Sorensen, a midwife in Cedar City, UT. The charges are very serious. We are always concerned when there has been loss of life or potential misconduct of a midwife. Midwifery care is meant for normal pregnancies proceeding in a normal manner, and there are definitely times when pregnancy is outside the scope of midwifery practice. We cannot comment on this case specifically as it must work its way through the legal process. We offer our condolences to the family who has suffered the loss of their child. This statement reminds me a lot of when MANA’s death rate came out. They said that midwifery care is for low risk pregnancies (as to excuse the astronomical rates of death for twins, vbac, and breech births), but did not make any practice recommendations. The Utah Midwives Association has done the same thing- they have said midwifery care is only appropriate for certain pregnancies, but does not have plans to actually change anything legislatively to ensure that midwifery care is only dispensed to women with low risk pregnancies. It also reminds me of the Valerie El Halta fiasco. When that happened Utah midwives also acted as though this was some kind of isolated incident or a deviation from the normal, but I happen to know that two of the midwifery schools in Utah teach breech, vbac, and twin births to students. I know that the trade magazine for home birth midwifery calls all these conditions “a variation of normal”. I’ve read Ina May Gaskin books that say the exact same thing. The standard you walk past is the standard you accept, and unless UMA lobbies for common sense policies to ensure the safety of moms and babies I will be forced to assume that they find the legislative situation of utah midwives acceptable. The mention of the family is appreciated. I wonder if their condolences extend to plans to make sure no other family ever has to endure such a tragedy again? The title of this post is a bold statement to make, I know. How could someone preside over a preventable death and not change their practices? I can’t pretend to know the mental gymnastics needed to justify the practices at Pathway to Wellness birth suites. I have very good evidence that Vickie Sorensen and Camille Wilcox learned nothing from taking on a twin birth with additional risk factors, because they took on another twin birth with additional risk factors after that poor baby lost its life at the path to wellness birth suite (its called a birth suite because legally its not a birth center). I contact the midwives at the Pathway to Wellness Center. I sent them an email and asked if they would be willing to deliver twins. I also asked them if I could be supported with gestational diabetes and at the age of 41. I was so happy the day that I heard back from Camille, one of the midwives at the center, when she said “YES”- they could deliver twins, and that they don’t consider my age or the diabetes a risk because older women usually take better care of their health and I didn’t need medication to regulate the diabetes. Risks of pre-existing diabetes in pregnancy are numerous and requires a lot of monitoring– monitoring direct entry midwives are not able to provide. Risks of advanced maternal age (meaning over 35) are quite similar to the risks for pre-existing diabetes, so it would not be unreasonable to think that each risk factors could exasperate the other. If a mother is actually informed of the risks of such a pregnancy and decides to do it out of hospital anyway, then I support her right to choose out of hospital birth. But this case illustrates the problem with home birth and informed consent quite vividly- the midwives don’t believe that there is any significant risk, so they by definition cannot inform the patient of the risk. The only condition I have seen midwives reject uniformly is complete placenta previa, where the placenta grows over the cervix. Literally everything else has been fair game for them. I don’t mean to imply the view that this was a good idea for an out of hospital birth is rare among Utah midwives, its actually quite common for direct entry midwives nationally. Trade magazines such as Midwifery Today declare that twins are just a variation of normal, along with a lot of stories of midwives delivering twins at home intended to support the view that this is entirely safe. Mr. Alexander took us all by surprise by being born first. No wonder the midwives had had a hard time finding his heart beat during labor. He was moving down, down, down to be the first born! He was so sweet and innocent that I just laugh every time I think about holding him that first time, thinking it was Megan- but so obvious that he was not Megan. Again, another surprise! Giselle said, “I have a foot!” Megan’s feet were down and coming through the birth canal. The little girl must have turned around right after Alex was born! Giselle continued to help Megan with a now breech delivery… one foot, two feet…I reached behind me and felt little baby feet kicking in the water… legs, chest, one arm, then two arms were out. John could see that Megan stopped kicking and that her body was floating in the water with no movement. There are a few breech presentations, feet first is called a footling breech. It is the most dangerous breech presentation. I have an emergency childbirth guide for military OBGYNs that explains how and why footling breech births are the absolute worst presentation with a ‘significant’ increase in risk for complications and death. When Megan was completely out of the water, she wasn’t able to breathe. The midwives held her white, limp body and started calling her name. She was given a breath through mouth-to-mouth resuscitation and they tried to stimulate her with pats and calling her name. Megan took one gasp and then stopped breathing again. They checked her heart and it was still beating. The cord was cut and the team rushed Megan into the other room and onto the crib so they could continue the resuscitation work. John and the midwives continued to stimulate her, give her mouth-to-mouth breaths and also used some cayenne solution on her chest to get her respiratory system jump started. After about 4 minutes, Megan was breathing successfully on her own. We found out later that the two placentas were fused together. When Alex was born, the placentas detached. By the time Megan was born, just 14 minutes after Alex, Megan’s placenta had completely shut down. Not sure why they think she only missed one minute of oxygen. They do not use electronic fetal monitoring so everyone has to guess about how long the baby went without oxygen.I don’t know who told her a baby can hold its breath for 20 minutes without brain damage (probably her clueless midwives), but they were lying to her. Every source I could find said 5 minutes before hypoxia sets in, even Ina May Gaskin says so and she is the big name in home birth midwives. All the other indicators of hypoxic brain injury require hospital equipment to detect, and a lot of the time these brain injuries do not become apparent until years after the birth. There is no way of knowing if that tiny baby came out of this unscathed without following up in several years. The mom is happy because she thinks she received great care. Her babies weren’t dead, although they came much closer to death than they ever needed to, and were attended by incompetent practitioners who think that sprinkling pepper on a baby is a better idea than calling 911 when they aren’t breathing. I realize the birth story I linked to may soon disappear once it reflects poorly on the midwifery community (a story about a near dead breech birth was removed after I reported on it before), so I have saved this one in its entirety on my computer just in case. I hope the prosecution for the VIckie Sorensen case is paying attention- this additional birth shows a craven disregard for the life of newborns and mothers on Vickie Sorensen’s part. 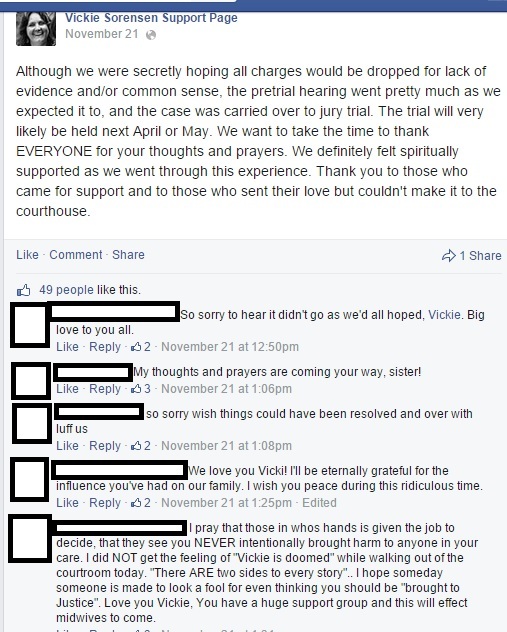 Delivering one dead twin wasn’t enough to discourage her from taking on twins again. Most people try to learn from their mistakes, especially when they are costly to others, but this mother-daughter midwife team seems to think that its normal or acceptable to ignore what they have been responsible for (when the outcome is bad, anyway). Regular people would be tormented by even possibly having played a role in a newborn death, these midwives are so unconcerned about it that they decided to risk it again.